Market volatility returned in October with a vengeance following a strong advance for the U.S. stock market since early May. The S&P 500® Index of U.S. large company stocks tumbled nearly 7% from its peak as of October 11 amid concerns about trade and rising interest rates. The return of volatility served as a strong reminder that financial markets are volatile by nature and that different asset classes move in-and-out of favor over time. Those shifts can sometimes happen suddenly, which is why investing in a globally diversified portfolio is so important. Take defensive asset classes such as gold—which moved from a laggard to a leader, delivering positive gains as stocks tumbled. While short-term volatility can be unsettling, it’s important to remember that staying diversified and focused on your longer-term goals as different asset classes move up and down the performance rankings are among the keys to long-term investment success. It's important to note that when commentators talk about "the market" being up or down, they're typically citing the performance of indexes such as the Dow Jones Industrial Average or the S&P 500® Index. However, investors should understand that these commonly cited indexes represent only one piece of the overall market. Each is a measure of U.S. large-cap stocks, with the Dow consisting of just 30 companies and the S&P consisting of about 500. In fact, the primary U.S. large cap stock ETF used in Schwab Intelligent Portfolios® has kept pace with the S&P 500 Index in 2018, with each advancing about 10.6% through the end of September. But the global stock market includes far more than just U.S. large-cap stocks and also includes thousands of companies across U.S. small-cap stocks, international developed markets and emerging markets. Beyond stocks, the market also includes various types of bonds, real estate, commodities, cash and other investments. To understand how the entire market has performed and how that might impact your diversified portfolio, investors need to understand how each of the indexes that measure these various market segments has performed. Smart investors invest in more than stocks. U.S. large cap stocks can be highly volatile, as evidenced by the S&P 500's February 2018 "correction" of more than 10%, and a more than 55% decline during the financial crisis. 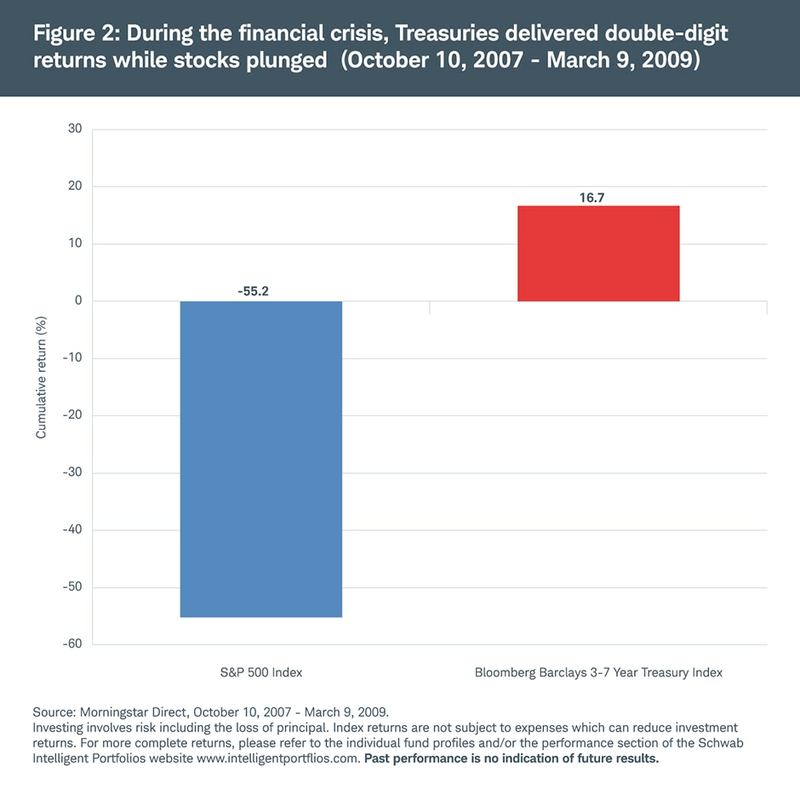 By contrast, Treasury bonds were a performance leader during the financial crisis with double-digit returns while stocks plummeted. To keep up with the S&P 500 this year, a portfolio would have needed to be concentrated in U.S. stocks. But being concentrated in U.S. stocks also would have meant a 55% drawdown in your portfolio during the financial crisis. If you're tempted to focus solely on the short-term gains for U.S. stocks, ask yourself if you would have been comfortable with that large of a decline during the financial crisis. Focusing too much on the top-performing asset class in the short-term often leads to market timing and performance chasing that typically results in disappointing outcomes for investors. Investing in a diversified portfolio that includes a mix of different asset classes can help you establish a plan that works towards your long-term financial goals while moderating the short-term ups and downs of investing. Stocks can provide growth over time but come with potentially high volatility. Bonds can provide income and are typically less volatile than stocks. Commodities and real estate can help provide potential inflation protection. Cash provides ballast during the inevitable times of turbulence. A diversified portfolio that matches your risk profile might outperform the Dow or S&P 500 at certain times and underperform at others. 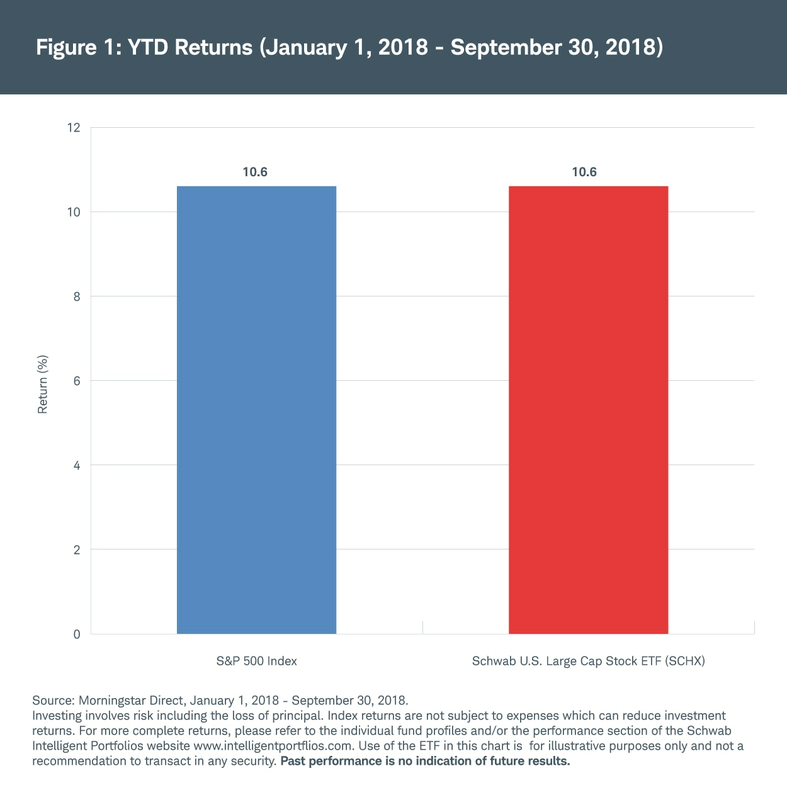 In recent months, more aggressive portfolios that emphasized stocks tended to perform best; however, in early 2018 more conservative portfolios that emphasized bonds did better. The goal of diversification is to combine investments with different characteristics into a portfolio that can help you reach your financial goals over time, while also allowing you to sleep at night. The outperformance of U.S. over foreign stocks this year might lead some investors to question the need for international investments in their portfolios. However, a quick review of history illustrates the benefits of global diversification and shows how performance leadership tends to cycle across different geographies over time. Many different economic factors—such as gross domestic product (GDP), interest rate differences, currency movement, political events and even investor sentiment—can influence which region currently leads in performance. But because the landscape is constantly shifting, spreading investments across the globe can help your portfolio benefit from whichever region is in favor at any given time. 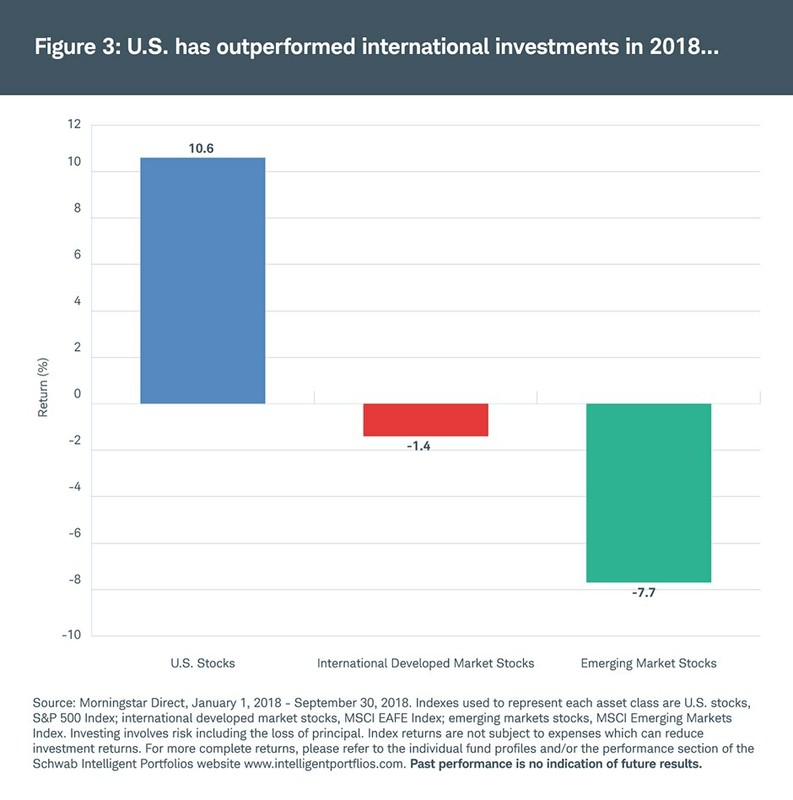 While U.S. investments performed better than international investments so far in 2018, international investments led in 2017. The 2000s in particular, shows how U.S. investments can underperform over extended periods. 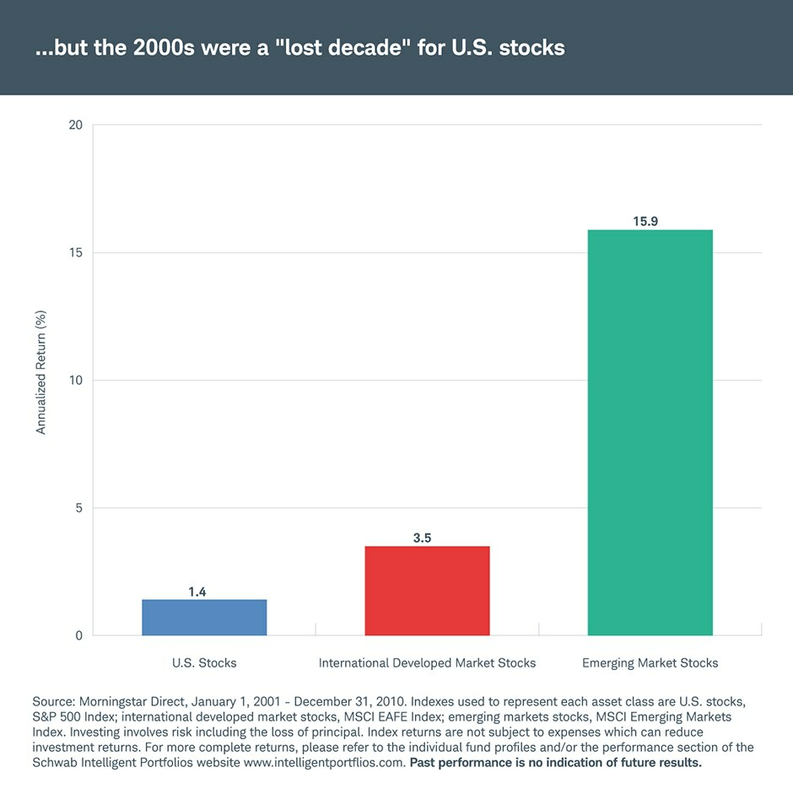 This period is often referred to as the “lost decade” for U.S. stocks because the S&P 500 underperformed over the entire decade while international markets delivered stronger returns. Over the long-term, a broadly diversified global portfolio is designed to help moderate declines during periods of volatility while delivering competitive risk-adjusted returns. In spite of the evidence presented highlighting the importance of global diversification, some investors might still be reluctant. Maybe you feel comfortable investing in "what you know," and what you know is the U.S. This tendency for investors to concentrate on their own country is known as "home country" bias and can leave you with little exposure to a wide swath of potential investments. U.S. companies represent less than half of the global stock market and only about a quarter of global economic activity as measured by gross domestic product (GDP). That means that international investments represent a large portion of the global investment opportunity set. They also offer a chance to enhance portfolio diversification by investing in foreign companies that have different characteristics and economic drivers than U.S. companies. Global diversification helps reduce the concentration risk of investing in one region, offering a potentially smoother ride over time. Schwab Intelligent Portfolios® is designed to recommend a diversified portfolio consistent with your risk profile and gives you several ways to measure your diversified portfolio's performance. One of the features available allows you to compare your portfolio with several different market indexes across various asset classes. This can give you a better idea of how each of these market segments has influenced your portfolio's performance, rather than looking at just one index like the Dow or the S&P 500. You can include up to five different indexes at a time across various types of stocks, bonds and commodities. Additionally, Schwab Intelligent Portfolios provides a Goal Tracker feature that allows you to set up a savings or income goal when you open an account and tracks your progress toward that goal over time. Staying focused on your long-term goals, ignoring the noise of short-term market movement and sticking with your plan through the inevitable ups and downs of the markets are among the keys to long-term investment success. Please read the Schwab Intelligent Portfolios disclosure' brochures for important information, pricing, and disclosures relating to Schwab Intelligent Portfolios. Schwab Intelligent Portfolios® is made available through Charles Schwab & Co. Inc. ("Schwab"), a dually registered investment advisor and broker dealer. Portfolio management services are provided by Charles Schwab Investment Advisory, Inc. ("CSIA"). Schwab and CSIA are subsidiaries of The Charles Schwab Corporation. Diversification and rebalancing strategies do not ensure a profit and do not protect against losses in declining markets. International investing may involve greater risk than U.S. Investments due to currency fluctuations, unforeseen political and economic events, and legal and regulatory structures in foreign countries. Investing in emerging markets may accentuate these risks. Data contained herein from third party providers is obtained from what are considered reliable sources. However, its accuracy, completeness or reliability cannot be guaranteed. The Schwab Center for Financial Research is a division of Charles Schwab & Co., Inc.
S&P 500® Index: An index of 500 stocks chosen for market size, liquidity, and industry grouping, among other factors. The S&P 500 Index is designed to be a leading indicator of U.S. equities and is meant to reflect the risk/return characteristics of the large-cap universe. MSCI EAFE: The MSCI EAFE Index is a stock market index that is designed to measure the equity market performance of developed markets outside of the U.S. & Canada. It is maintained by MSCI Barra, a provider of investment decision support tools; the EAFE acronym stands for Europe, Australasia and Far East. MSCI EM: The MSCI Emerging Markets Index is an index created by Morgan Stanley Capital International (MSCI) designed to measure equity market performance in global emerging markets. It is a float-adjusted market capitalization index that consists of indices in 23 emerging economies: Brazil, Chile, China, Colombia, Czech Republic, Egypt, Hungary, India, Indonesia, Korea, Malaysia, Mexico, Morocco, Peru, Philippines, Poland, Qatar, Russia, South Africa, Taiwan, Thailand, Turkey and the United Arab Emirates. Bloomberg Barclays Treasury 3-7 year Index measures US dollar-denominated, fixed-rate, nominal debt issued by the US Treasury. Treasury bills are excluded by the maturity constraint, but are part of a separate Short Treasury Index.